What is a Da Form 3595 R? 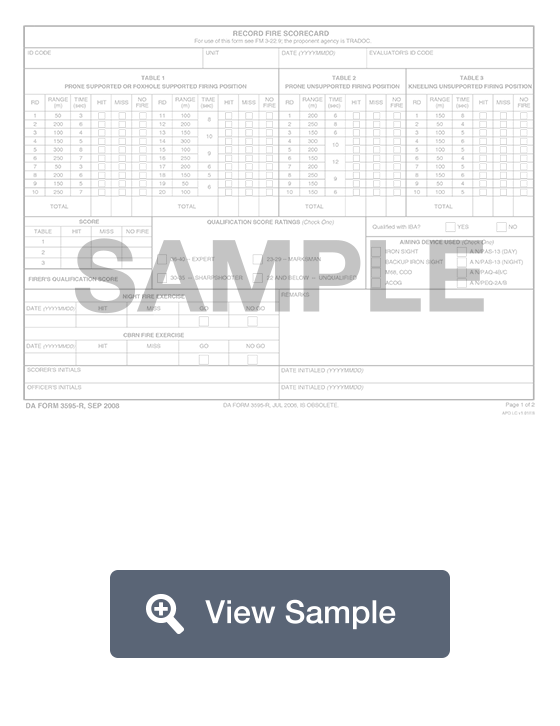 A fillable DA 3595-R Form is used by the US Army as documentation of a soldier's ability to fire a weapon. this form is also known as a Record Fire Scorecard. The form allows for recording the soldier's ability to shoot different types of firearms, firing positions, as well as ranges. It may also include night firing. Hits, misses, and even not shooting will all be documented on this form. A DA Form 3595 will be used by the Department of the Army. It is known as a Record Fire Scorecard and will be used to keep a record of a soldier’s shooting ability. This will ensure that a member of the Armed Forces has been properly trained in the use of various firearms and in the different ways to fire a gun. The form will allow the tester to record a variety of scores with different firearms, firing positions, and ranges. Different scenarios may be tested as well, such as a night firing test. They can record how many hits, misses, and no fires there were during the firing exam. The final score will be tallied to assign a rank to the person being examined. Create a free Da Form 3595 R in minutes with our professional document builder.